To make the filling: Bring the figs to boil in 4 cups of water in medium size sauce pan. Let simmer for 15 minutes. Strain the figs and save some water. Cool the cooked figs, then grind all the above ingredients together. Mix and store in a bowl covered in plastic wrap or a sealable container. Refrigerate until ready to use later. You can store this filling for a few days. Sift together the flour, baking powder and sugar into a large bowl. Add the shortening with your hands (it’s easier) and mix together lightly. Make an opening in middle of the dough with your hand and add the eggs. Mix again with your hands and, gradually, add the vanilla and milk, a little at a time. When all the ingredients are incorporated (don’t overmix – you aren’t making bread! ), divide the dough into about 12 balls. Wrap each ball with waxed paper and refrigerate. When ready to assemble, on a floured board, roll out one dough ball into an approximately 12-15-inch x 12-inch rectangle. Going down the rectangle, cut across the rectangle at every 3 inches – you will have 4-5 long strips. Place a long strip of filling in each dough length. Fold the dough over with the seam on bottom. Cut out cookies at an angle, every three or four inches. Place the cookies on cookie sheet. Bake for 8-10 minutes. Cool completely on cooling racks, or overnight on a table, then frost in the morning or later that day. Mix all the frosting ingredients together in a bowl until you have a very thin frosting. Carefully take a cookie, dip into the frosting, and scrape off the excess frosting on the inside of the bowl. Repeat with each cookie, placing them on cooling racks to dry. Place sheets of waxed paper under the racks to catch excess frosting. Before the frosting hardens, sprinkle the cookies with sprinkles or chopped walnuts, if desired. In Recipes-list.com we have selected the most viewed recipes from category - uncategorized . Enjoy the best recipes specially selected for you! 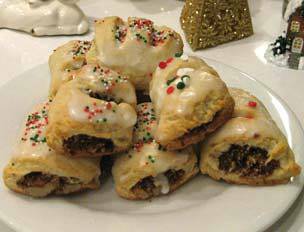 Aunt Rachel’s Cucidatis (Italian Christmas Fig Cookies) is the right choice that will satisfy all your claims.